Australian late 19th century, handpainted flower vase | Jenkinson Antiques - an ever changing cabinet of curiosities! 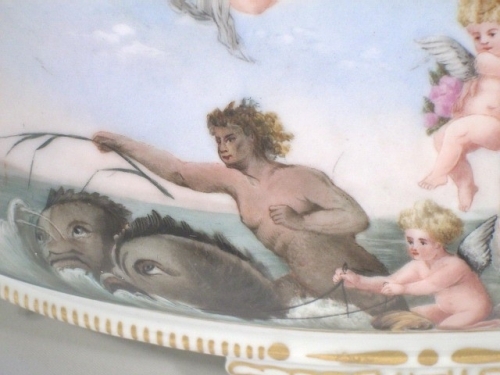 The porcelain flower vase is decorated with scenes derived from themes of classical mythology familiar to most art lovers at the end of the 19th century. 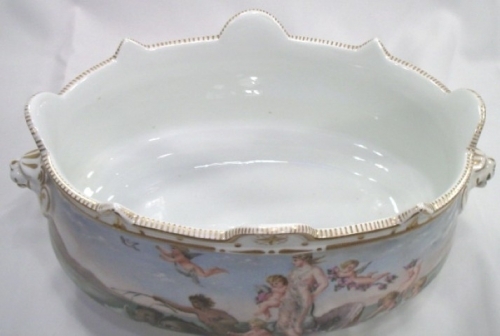 It is a "one-off" creation, c. 1900. This vase was decorated by Catherine Snowball, an Australian artist who trained in Paris, and returned to Australia to live in Melbourne, c. 1902. 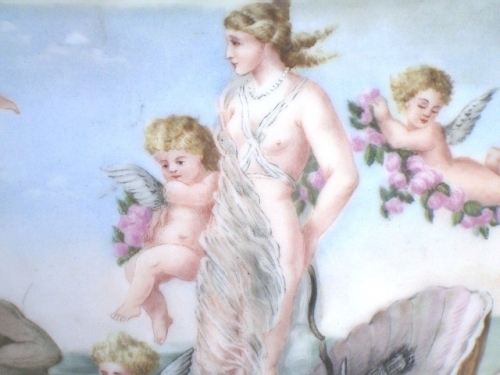 On one side of it we see an heroic young woman (perhaps Catherine Snowball herself) as Diana the Huntress, looking forward with a serene expression, attended by cherubs in flight bearing garlands of lilac coloured flowers (probably roses). She is standing almost naked on a clam shell, thereby referencing Boticelli's Birth of Venus: the colours used further reflect the antique. 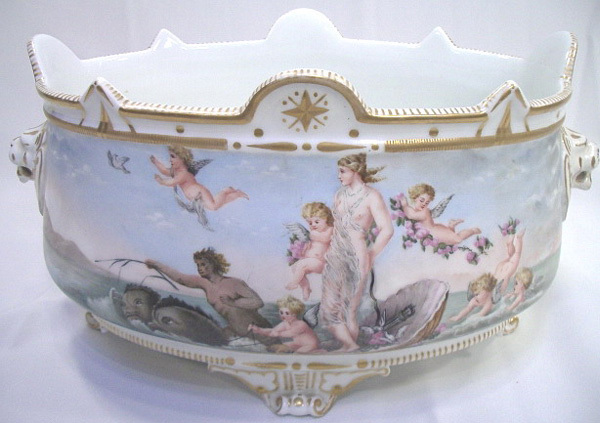 Diana's bow and arrows are behind her on the shell, draped with flowers and accompanied by doves. The shell is propelled across Neapolitan seas by a pair of dolphins driven by a smiling Nubian attendant. Clearly this is a happy event. 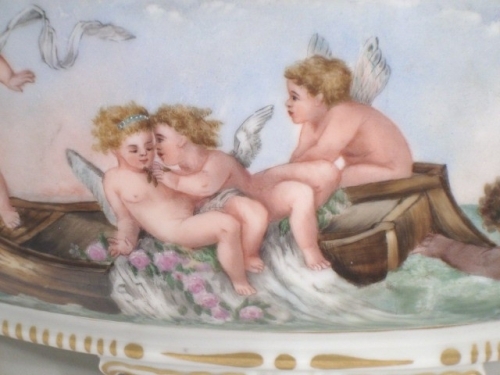 The cherubs hover about Diana and the assembly follows, in an almost biblical way, a leading dove in flight. The theme is Victorian Olympian: the message is that of a young woman who is journeying towards love, her resistance placed aside and nature buoyantly supports her quest. The traditional meanings of colours often derive from a spiritual context, but it is a language largely unknown today. Lilac is a cool and warm colour with its mix of blue (spirituality and integrity) and red (energy and strength) and/this indicates union, carrying as it does the regal symbolism of purple (once so expensive that it could only be afforded by royalty or high clergy). The lilac flower itself is considered the harbinger of Spring, and the lilac coloured roses indicate magical enchantment: often first love or love at first sight. In parts of the Mediterranean , lilac is associated with Easter and thereby the Christian promise of a new birth into a living hope. 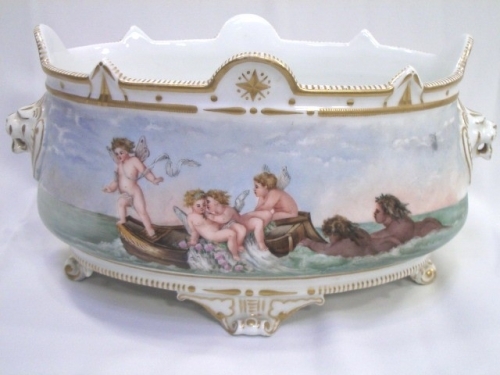 The obverse side has a scene of 4 joyful cherubs in a wooden boat decorated with the same flowers, pushed through the sea by a pair of Nubian children swimming at the stern. These cherubs are as if the bride-to-be's attendants. The doves symbolise God's spirit (in the New Testament) and even Warhol used a dove to represent the Holy Spirit in his 'The Last Supper (Dove)', albeit in a much more commercial image. Pre-Christian civilizations used doves to symbolise feminine fertility and procreation. The symbolism on the vase was an unspoken but not unknown message when it was first produced, but today these meanings are a lost world for many. So we offer them here as our attempt at decoding this romantic story. That the story is told on a flower vase, representing as it does the means for continuing floral tribute, is a sweet expression of hope for an enduring commitment. 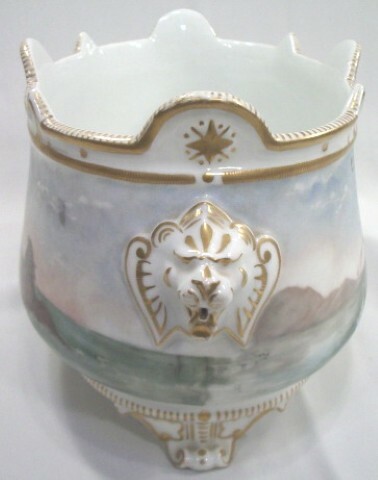 The vase is further guild decorated to the imperial mounts, feet and rim. 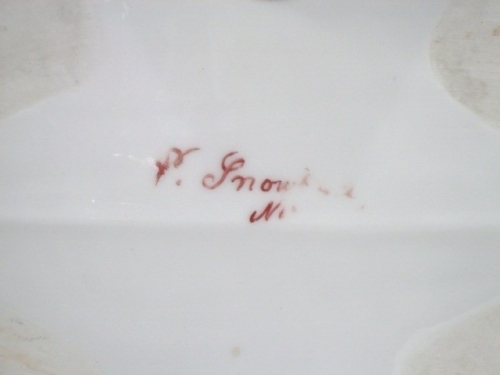 Provenance: By decent from Snowball to the family in Unley from whom purchased by the current vendor in 1983.